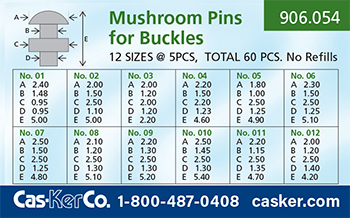 60-piece assortment of mushroom pins for watch band buckles. Five pieces each of 12 sizes. (60 pieces total). 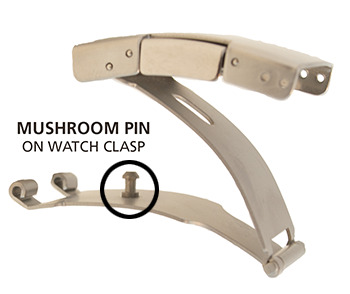 The mushroom pin or locking pin head locks a watch band foldover clasp in place. Over time, these can wear out with frequent use, but the good news is they are easy to replace! 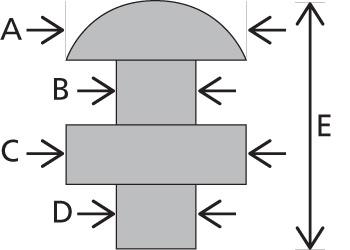 Friction fit at bottom of clasp - no need to replace the entire clasp. Our assortment of twelve sizes comes with a handy size chart to help you fit any clasp. Most small watch parts orders ship the day your order is received. For small parts orders under $50, select First Class Mail at checkout for the most economical shipping option. Typical delivery time is 1 to 4 days, depending on destination.